I’m off to the Epsom Derby tomorrow, so this seems like a good opportunity to post up the wonderfully satirical painting The Derby Day by William Powell Frith. William Powell Frith, The Derby Day (1856-8). Oil on canvas. 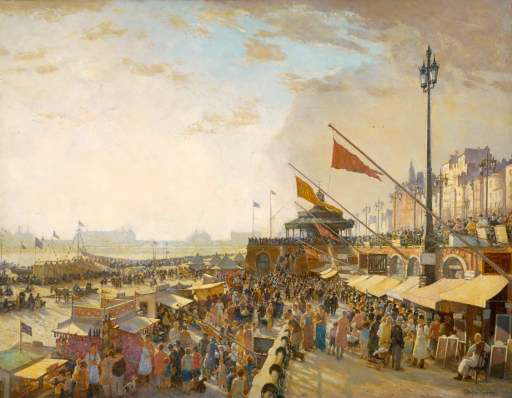 The painting presents a panorama of modern Victorian life and when it was first exhibited at the Royal Academy in 1858, it proved so popular that a rail had to be put up to keep back the crowds. There are three main incidents. On the far left a group of men in top hats focus on the ‘thimble-rigger‘ with his table. In the centre is an acrobat and his son, who looks longingly at a sumptuous picnic being laid out by a footman. Behind them are carriages filled with racegoers, including, on the far right, the mistress of a man leaning against the carriage. It’s a captivating painting, which naturally, needs to be seen in the flesh. It’s on display in Room 13 of Tate Britain along with a selection of paintings under the heading ‘The Art of Leisure’ (devised by curator Christine Riding). I visited the museum for some last minute inspiration before embarking on this trip, and was lucky enough to have Tony Godfrey from Sotheby’s Institute of Art as my guide. This room felt particularly relevant. “Queen Victoria died in 1901. During her long reign the enjoyment of leisure time had spread beyond the wealthy upper classes to a wider range of people living in British cities. The lives of working people were hard, but they had greater spending power, shorter working hours and more holidays: more opportunities to enjoy themselves. A great variety of new activities were on offer: music halls, railway excursions, fairgrounds, commercial exhibitions and sporting events; or just listening to the band in one of the new public parks. The growth of the railways enabled city people to head for the country or seaside for picnics, rambles, swimming and boating. By 1911, just over half of the population of England and Wales made at least one seaside trip every year. 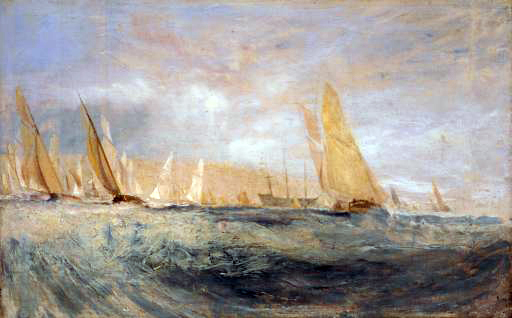 Joseph Mallord William Turner Sketch for `East Cowes Castle, the Regatta Beating to Windward’ No. 3 (1827). Oil on canvas. 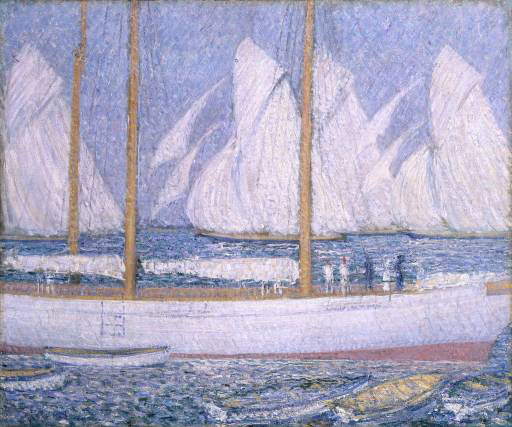 Philip Wilson Steer A Procession of Yachts (1892-3). Oil on canvas. 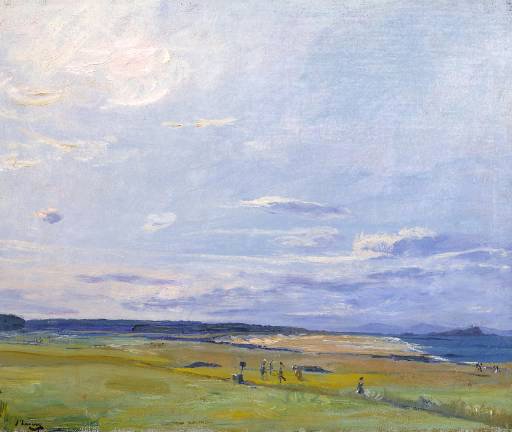 Sir John Lavery The Golf Course, North Berwick (1922). Oil on canvas. 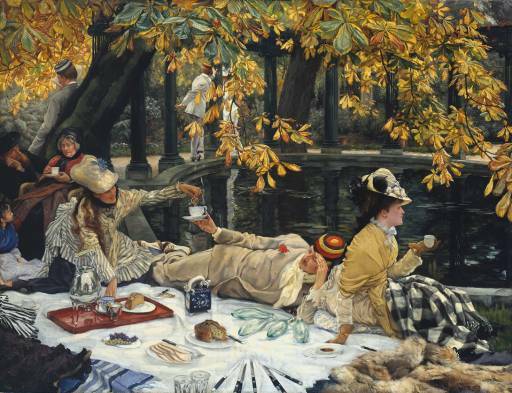 James Tissot Holyday (circa 1876). Oil on canvas. 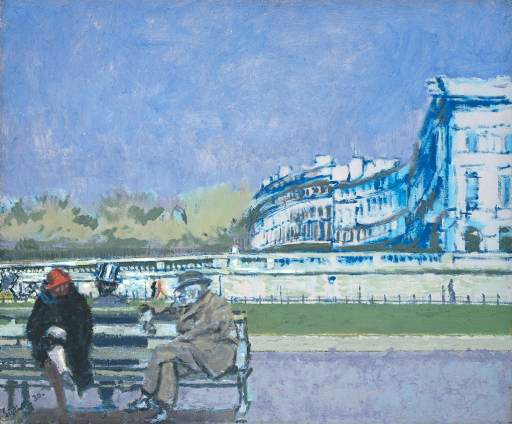 Walter Richard Sickert The Front at Hove (1930). Oil on canvas. Charles Cundall Bank Holiday, Brighton (1933). Oil on canvas. 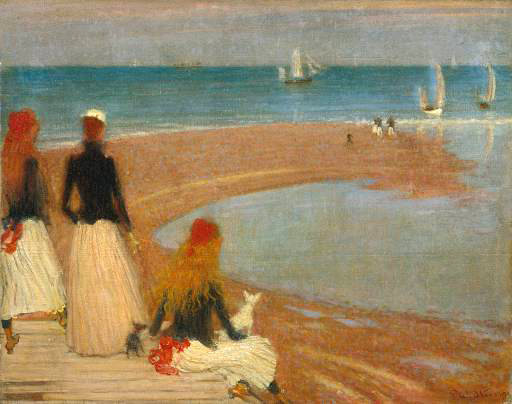 Philip Wilson Steer The Beach at Walberswick (circa 1889). Oil on wood. 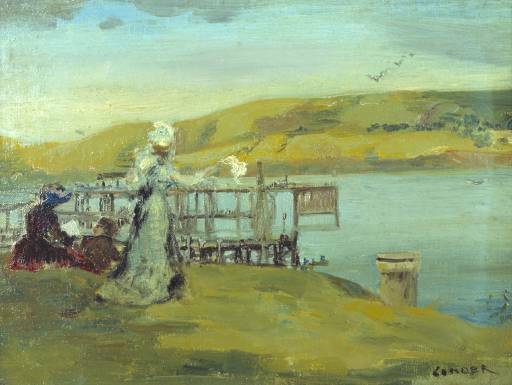 Charles Conder By the Sea: Swanage (circa 1901). Oil on canvas. 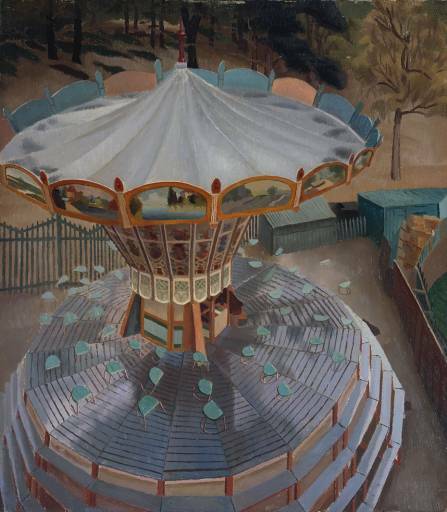 Sir Stanley Spencer The Roundabout (1923). Oil on canvas. This entry was posted on Friday, June 6th, 2008 at 12:56 pm	and is filed under ART & LEISURE, INSPIRATION, RESEARCH. You can follow any responses to this entry through the RSS 2.0 feed. Both comments and pings are currently closed.